How to download WhatsApp messages from iCloud backup? Hello! I have my WhatsApp messages backed up in iCloud from iPhone 6. Is there any way that I can get back my WhatsApp messages without restoring the whole device. If yes, how it works? Thanks!!! WhatsApp is the most popular instant messaging and multimedia file sharing platform for iPhone users. It provides a convenient way to send and receive messages and supported files. Irrespective of the platform, WhatsApp provides the chat history Backup, Restore, and Email features. However, a great number of iPhone users prefer using iTunes or iCloud to keep their data safe. Then here comes the question: How to download WhatsApp messages from iCloud backup? Stop panic, iFonebox can help! Compatible with a large range of devices and iOS system, including the latest iPhone X and iPhone 8. Selectively data recovery without restoring your whole backup. With iFonebox, you’re allowed to retrieve data separately without wiping any existing data on your device. Support data preview before extracting data from Backup or device, which means you don’t have to restore the whole backup to find specific data outof uncertainty. Intuitive user interface and well organized. This program is extremely easy to use, and Offers you enough flexibility to migrate contacts from old iPhone to new iPhone 8. 100% secure and protect your privacy definitely. During this process, all the contents on both of your old iPhone and new iPhone will be kept safe, and you won’t lose any data or file. With above advanced program features, iFonebox is certainly the best option for you to extract WhatsApp messages from iCloud backup. Compared to traditional recovery mode, you don’t have to restore the whole backup to device, which would wipe out all existing data you have. iFonebox provides an user-friendly way for you to selectively extract target data out of your backup. Sounds fantastic, isn’t it? 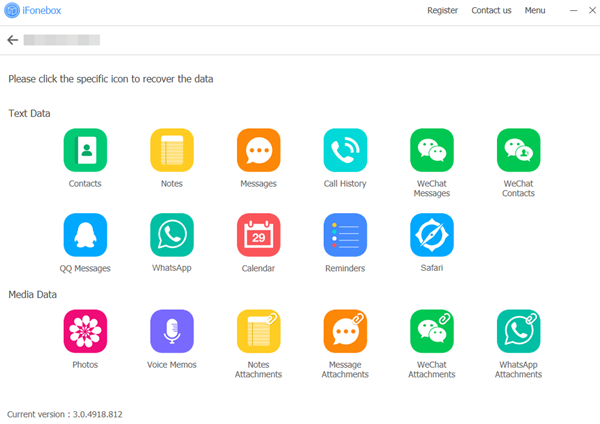 Furthermore, the interface of iFonebox is visualized, vivid and legible for users to understand and implement, which certainly satisfy all kinds of requirements and is absolutely the best option for you to export WhatsApp messages from iCloud backup. Please ensure to disconnect your device with your computer under this mode, in case the iCloud file be updated or modified. 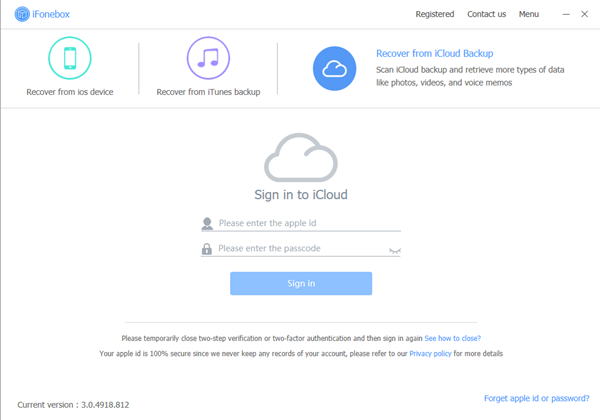 Please make sure that your Apple ID is in a normal state, and if you turn on the Apple ID two steps authentication, turn it off and try again. Click on WhatsApp messages item to start scanning automatically. 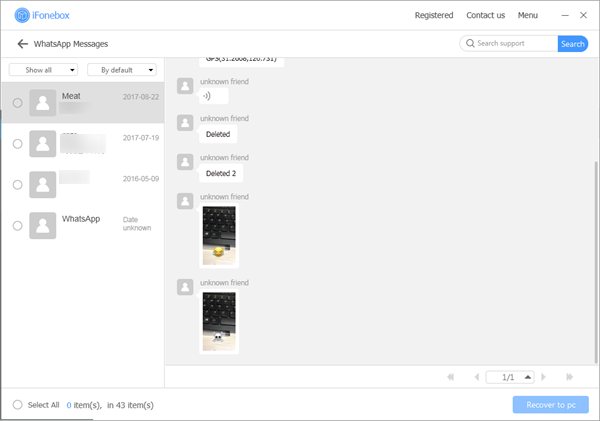 If you want to recover some attachments in it, please click on WhatsApp Attachments. It’s time to get your missing messages on WhatsApp back, all you need is select the information you want and click the Recover to PC, then the task is accomplished.